Beggar's Row is a small part of a sewer that has been converted into a homeless den in lower Riften, by the canal that runs through the center of the city. It is by the northern stairs down from upper Riften, opposite Elgrim's Elixirs. Outside the door are several barrels that are free to take from. 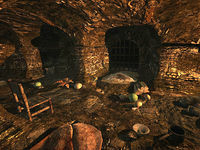 Beggar's Row is a heavily vaulted part of the sewer, that has two owned hay piles and one owned bed roll inside it. Madesi, Edda and Snilf all sleep in here at night. There is a campfire to the north and a couple of chairs, several food sacks and barrels around the place. Scattered about the floor are a couple of bottles of Nord mead and various vegetables, a raw rabbit leg and several pieces of cheese. At the southwest connection there are two bottles of skooma. There is a copy of the Speech skill book A Dance in Fire, v7 due north upon entering, under a fern. There is an Empty shadowmark on the right door step before the entrance. Esta página foi modificada pela última vez à(s) 03h19min de 23 de março de 2015.